Creation of eye-catching custom displays, portable and table top displays, banners, signage and graphics to attract visitors to your booth. Setting up and breaking down can be a challenge, and we are here to assist you and your team to assure a hassle-free installation. 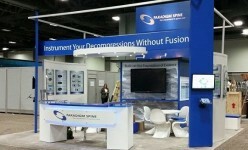 We can help you with marketing ideas and programs to create memorable promotions and attractive exhibits. Graphic designers are on staff to help you create work that customers can remember you by, long after the show.